Every week a certain students association stages the party. Here is an event calendar. Tickets can be bought for 4€ in the pre sale or (if available) at the same evening for 6€. You will find more information on Facebook or on the flyers at the university in the week of the event. When the first tones of the melody are played, everyone knows exactly what is happening: Running to the stage they are looking for their friends, fellow students or just strangers nearby. Meine Stadt holt ihren Mann Heim, ganz egal wo er auch ist. Diesen Reim schickt ihr der Mann heim, der sie so oft vermisst. Every one is lying in each others arms having goose bumps. Some are laughing, some are bawling and there is this one thing connecting all of us: The love for our city, the love for our university, the love for celebrating and the fact that the Schneckenhof is over for tonight. Next week we will be back again! There is something which belongs to our university like the Ehrenhof to the palace or the books to our library: The Schneckehof to Thursdays! Every week another students council or the AStA hosts a party. During the winter months in the Katakomben and in summer at the Schneckenhof. 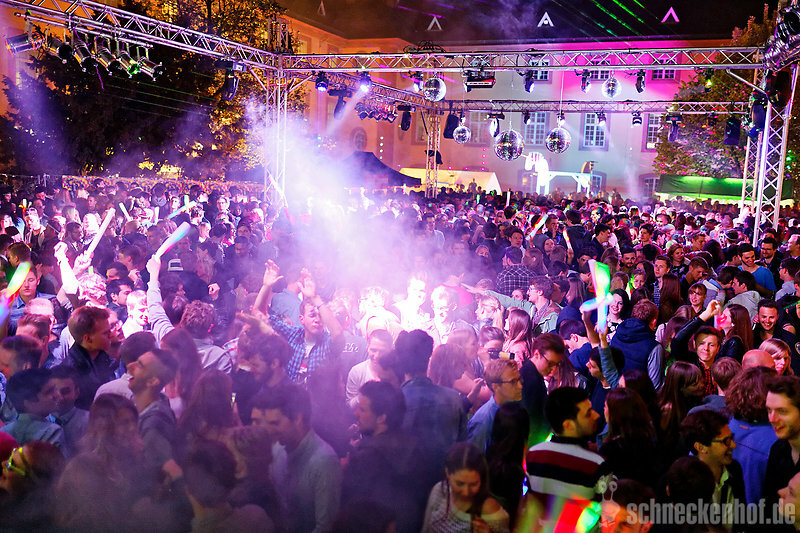 Since the 90s the Schneckenhof is an inherent part of many students’ Thursdays. As the biggest faculty at Mannheim University we have the ability to host a special party every semester. In the HWS, mostly in October, and in the FSS in April we organize a so called Schneckenhof. Through unique decorations or Give-Aways we try to offer a great and unforgettable party night. To offer everyone the possibility to go to nearby clubs afterwards, each party starts at 8 pm and finishes at 1 am. Feel like your studies kill the last small shred of creativity? Join our team and organize together with us a fantastic event! or click here for more information and a contact form.